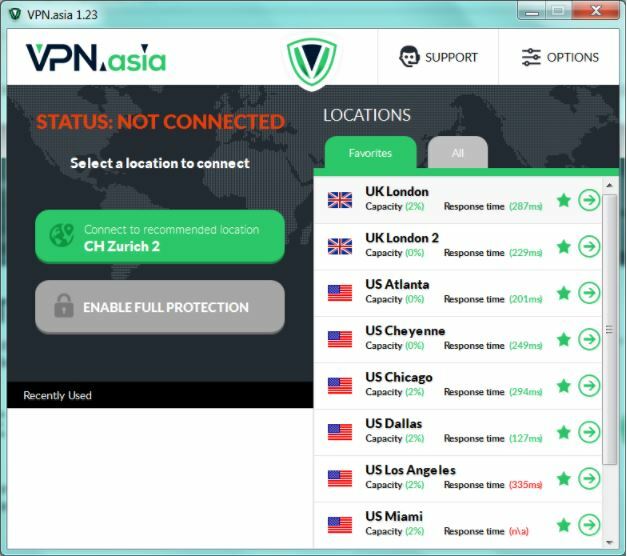 VPN.ASIA is a Belize-based provider offering 43 servers in 30 countries, AES-256 encryption backed by SHA-256 hash authentication, support for P2P file-sharing, no logs, and native cross-platform software. It’s also wallet-friendly, so there are many reasons for it to be an excellent VPN. Except for it’s not. Quite a few annoying issues popped up during my tests, and their live chat support was never around. Read on. VPN.ASIA has no free trial, so if you want to try it before committing long-term, you are stuck with a monthly subscription. 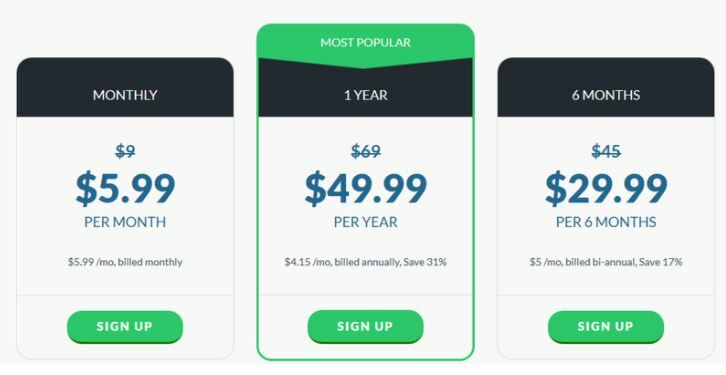 Their $6 monthly plan is a bargain while their bi-annual plan is conveniently priced at $30. The best deal here is the $50-worth annual subscription. All plans come with a seven-day money-back guarantee, and you can pay through a variety of gateways – Bitcoin, PayPal, credit cards, and more. You need to keep your wits sharp, however, because VPN.ASIA immediately sets up a recurring subscription with your payment processor – without your approval. VPN providers seriously need to stop doing that since it’s downright off-putting. 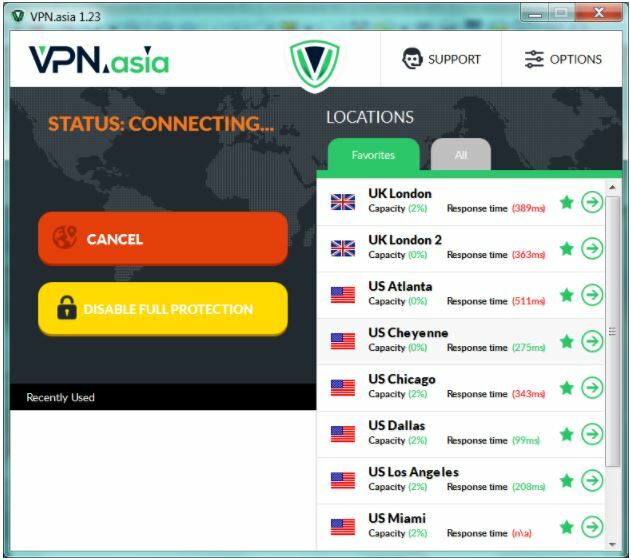 VPN.ASIA offers native software for Windows, Mac, iOS, and Android devices. You can also download OVPN configuration files and use OpenVPN software if you prefer. I found their Windows desktop client utterly bad. Its UI is poorly scaled or at least it looks that way. Too much of the real estate is dedicated to a useless Recommended Location button while the list of servers seems to come as an afterthought. The client never confirms when it’s connected. Through trial and error, I identified one of the servers actually got connected. 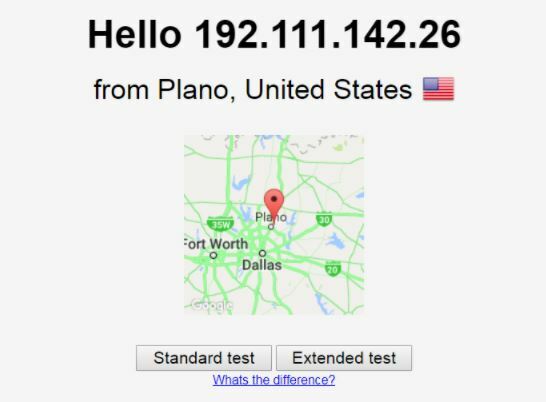 My DNS and IP tests revealed that, of all the available US servers, only the one in Dallas was working. Whenever I tried connecting to a different server in the US, the app would either automatically switch me to the Dallas server – without any notice – or just get stuck on Connecting. At the same time, the list regularly updates the servers load and availability – never mind that only a fraction of them work. Notably, it would display Connecting even when it was already connected. From bad to worse, I couldn’t connect to any of the UK servers from it. But more surprisingly so, the app refused to connect me to the server it recommended as the optimal for me – somehow it was in Zurich. The logic of this suggestion beats me since I’m in another hemisphere. But ask a question, any question, and they are suddenly unavailable. In my experience, nobody was available in 100% of instances I tried the chat option. If anything, a provider advertising a non-existent feature doesn’t instill trust. After fruitless attempts to troubleshoot their connectivity issues and a buggy client, I downloaded the OVPN files, which confirmed my suspicions. Out of all the US servers, the New York and Dallas servers managed to get connected. For the UK servers, only London 2 worked. There was nothing wrong with my VPN login credentials or OpenVPN setup. However, when VPN.ASIA’s desktop software was installed on my PC, the OpenVPN client showed that all TAP adapters were in use even when VPN.ASIA was not running. I had to uninstall the software to get OpenVPN to work. This has never happened before – OpenVPN was always able to run and use TAP adapters even when I had multiple desktop VPNs installed but not in use. The app features a few perks you might find useful. There is a one-button option to enable Full Protection, but there is no explanation as to what that entails. 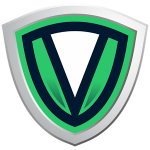 The General tab lets you save your login credentials, and enable automatic re-connect while advanced customization tab allows you to choose the protocol (OpenVPN TCP or UDP, Stealth, PPTP or L2TP), port, and set manual DNS servers preferences. 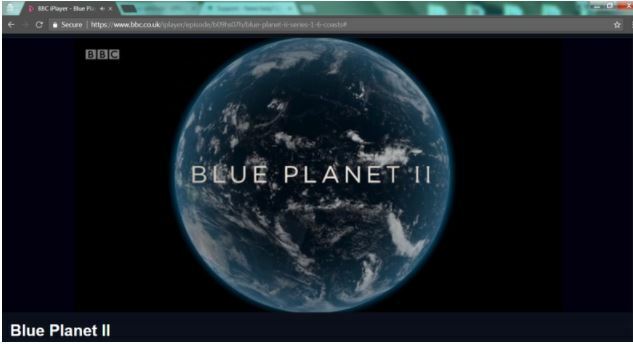 The service allows P2P and simultaneous use of up to four devices per license, but the devices need to be on different platforms (i.e., you can’t connect from 2 PCs at the same time). Families looking for multiple simultaneous connections might find this restriction too limiting. Their ToS explicitly prohibits shared use of a license from different IPs and P2P of copyrighted material, for which your account will be terminated. The provider collects and stores your account information, complete with your payment details. Their website collects your IP, and pages viewed, and it’s loaded with Google Analytics, cookies, and tracking beacons. The provider will share your aggregate and non-personally identifiable information (PII) with third parties for advertising, marketing, and research purposes. That’s just bad behavior for a paid service. VPN.ASIA left me with mixed feelings, at best. 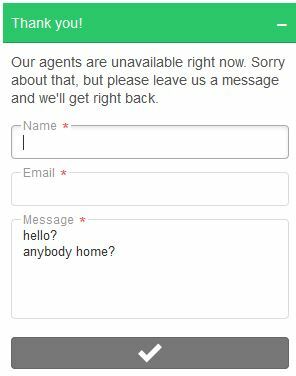 I am not happy with the always unavailable live chat support and the lack of a short free trial topped with the provider’s reluctance to honor its own refund policy. But worst of all was their desktop software and dysfunctional servers, which showed up as working. It’s cheap, so if you are a casual user you might find it a feasible option, but keep in mind they don’t tolerate torrenting of copyrighted material. The bottom line is I can’t think of a reason why I should recommend it. There are better options.